As an alumnus of a top-ranked and predominantly White college with little racial, ethnic, or socio-economic diversity, I have often wondered how many institutions like mine have or have not made a meaningful commitment to advancing racial and ethnic diversity on campus. One argument for greater diversity on campus is called “Critical Mass Theory,” which claims that once a group (e.g., Latino undergraduates) reaches a certain size within a college or university, its presence on campus will change the culture, norms, and values in ways beneficial to students in that group. Researchers do not agree on the exact point at which critical mass is achieved, but they think the tipping point is somewhere between 15 and 40 percent of the total student body. Thus, bringing in token numbers of Latino, Black, and low-income students on campus (as many selective colleges do) is not enough, but relatively modest increases in these groups can help. What is an Emerging HSI? In A Look at Latino Student Success, we discuss Hispanic-Serving Institutions (HSIs) — colleges that are above a 25 percent share of Latino undergraduates — and show they have smaller gaps in completion between Latino and White Students compared to non-HSIs. We suggest this success may be the result of changes to campus climate and culture that come with higher Latino enrollment on those campuses. Yet, data show emerging Hispanic-Serving Institutions (emerging HSIs) — colleges with between 15 and 24 percent Latino/a enrollment — can advance opportunities for Latino students as well. Although nearly half of emerging HSIs are community colleges, four-year emerging HSIs offer particularly important pathways for Latino students seeking a bachelor’s degree and beyond. About 1 in 7 Latino undergraduates at public and private degree-granting colleges attend an emerging HSI. More strikingly, emerging HSIs accounted for about one-fifth of all Latino bachelor’s degree recipients in 2014-15. But do we also see smaller gaps in completion at emerging HSIs, even though they fall below the 25 percent threshold and at the lower end what is considered critical mass? Do Latino students succeed at emerging HSIs? To answer this question, we compared graduation rates of emerging HSIs, HSIs, and other four-year colleges that enrolled students with similar levels of academic preparation. More specifically, we calculated the average difference in the six-year bachelor’s graduation rate between Latino and White students attending these schools. (See chart below.) At less selective and moderately selective colleges (where institutions tend to have lower completion rates for Latino students), emerging HSIs typically have smaller gaps in graduation rates between Latino and White students than schools with relatively few Latino students — suggesting that higher Latino enrollment on campus may lead to more equitable student outcomes. These differences are most pronounced among moderately selective schools (colleges with average SATs between 1010 and 1192). However, at the most selective institutions, the completion gaps were actually higher at emerging HSIs. The graduation rate gap at all other selective institutions is only 4.6 percent because the group includes some extremely selective and well-resourced institutions, such as Yale, that have been able to reduce or close the gap completely. Even the most selective emerging HSIs rarely have the same level of resources as Ivy League and Ivy League-like institutions. Note: We did not examine graduation rates for HSIs in the 4th SAT quartile because only two HSIs are among the most selective colleges. A similar pattern holds for graduation rates at emerging HSIs. (See table.) In quartiles 1 – 3, the Latino graduation rate at emerging HSIs is about the same or a little higher than the Latino graduation rate at colleges with lower Latino enrollment. HSIs have even higher graduation rates than emerging HSIs within these selectivity groups. 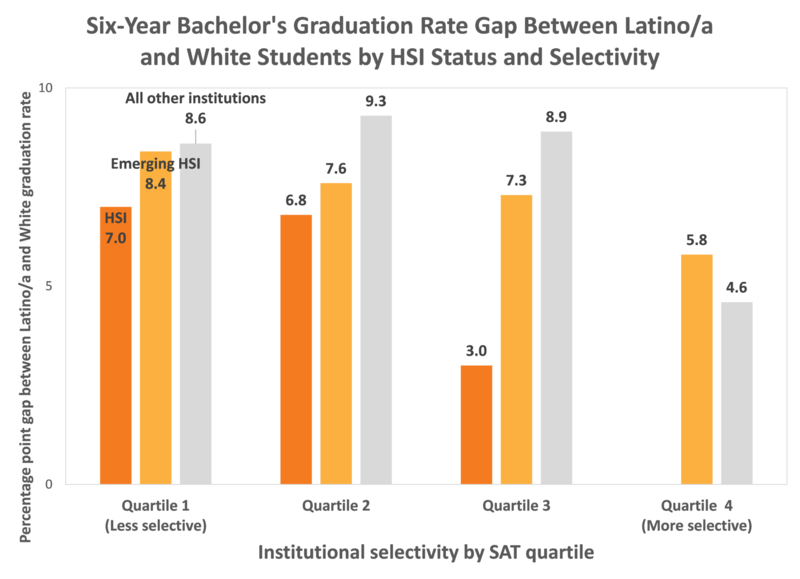 However, the Latino graduation rate at highly selective schools is somewhat lower at emerging HSIs compared to all other institutions because many of the predominantly White institutions are extremely selective and have achieved very high graduation rates overall (the average White graduation rate at highly selective non-emerging HSIs is 85 percent). Keep in mind that emerging HSIs and HSIs are generally producing smaller gaps in completion outcomes than other colleges even though they serve higher shares of low-income students. For instance, emerging HSIs in the third SAT quartile enrolled 32 percent Pell recipients among first-year students in 2014-15 compared to 26 percent at similarly selective schools with little Latino enrolment. (See chart.) The pattern also holds for highly selective institutions. 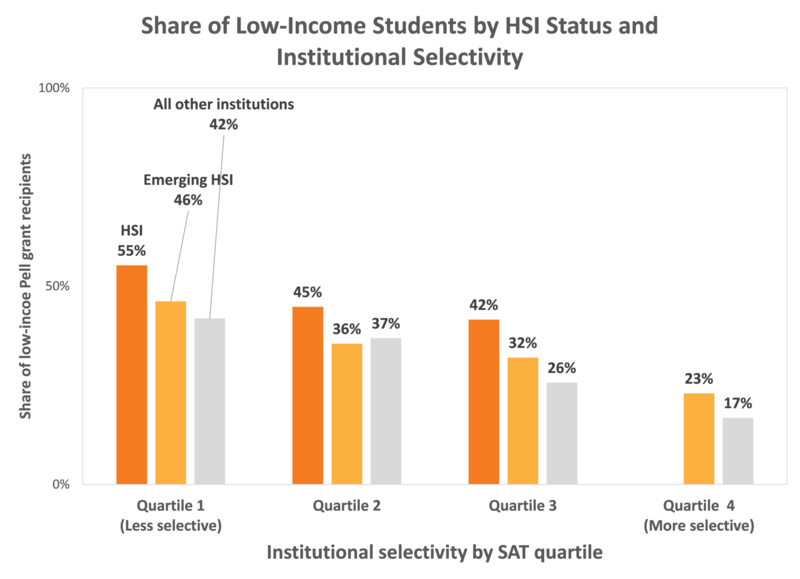 In quartile 4, nearly one-quarter of students attending emerging HSIs are low-income compared to only one in six students at other institutions. What kinds of colleges are Emerging HSIs? 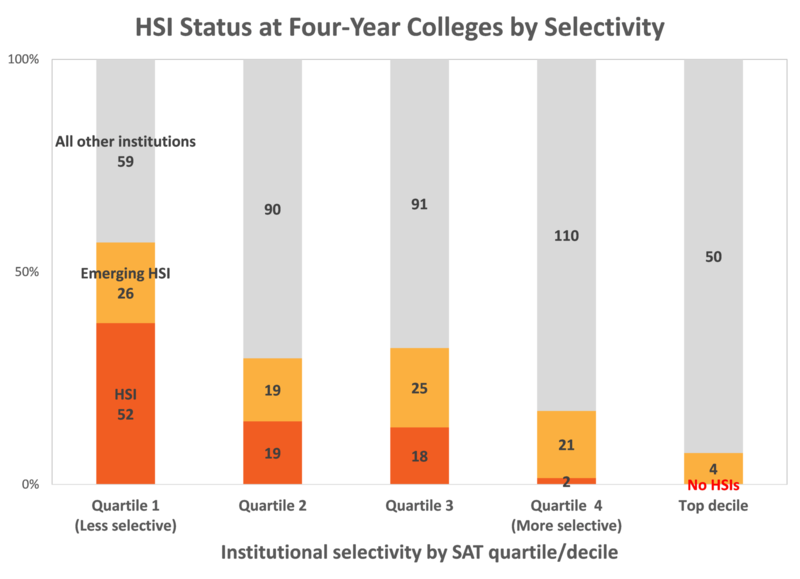 But aside from how emerging HSIs compare to other four-year schools overall, how many highly selective colleges and universities have reached emerging HSI status? The answer is not as many as there should be, given that the share of Latino college-aged high school graduates has grown steadily to 21 percent nationally. Less than 1 out of 5 institutions in the top quartile of average SAT scores enroll at least 15 percent Latino students and few of these are the extremely selective schools in the top decile of SAT scores. (See chart.) Shockingly, many highly selective schools with low Latino enrollment include flagship public universities charged with serving all students in their state, such as University of Illinois at Urbana-Champaign and Rutgers University at New Brunswick. Note: This chart may exclude some highly selective colleges that do not require students to submit SAT or ACT scores. For instance, although Pitzer College does not report SAT data to the U.S. Department of Education, it is another top college that enrolls less than 15 percent Latino students (despite being located outside Los Angeles). The concentration of Latino students in less selective colleges not only matters because more selective colleges lose out on the benefits of greater enrollment of Latino students, but also because Latino students have greater opportunities for success at more selective colleges. For instance, Latino students enrolled at the top quartile of institutions graduate at twice the rate of their peers attending the bottom quartile of institutions: 80 percent versus 40 percent completion. Some of this difference may be accounted for by differences in preparation between students at less selective and more selective schools, but more selective colleges also have more resources to provide Latino students with academic and financial support. Making matters worse, the President’s Budget Proposal calls for the zeroing out several grant programs that can go to HSIs and emerging HSIs to help expand supports and academic opportunities for Latino students. The data examined in this blog show policymakers should be doing the opposite by strengthening investments in these colleges and encouraging more selective institutions to grow Latino enrollment. In turn, selective colleges need to recognize the important role they play in advancing opportunity for the growing demographic wave of Latino young adults. They should see the benefits associated with having a larger Latino presence on campus and find ways to align greater diversity with their overall mission. In a later blog, we will take a closer look at the top 50 or so most selective colleges and suggest ways they and their peers can address under-enrollment of Latino undergraduates. In the meantime, you can explore A Look at Latino Student Success for more detailed information on the enrollment and completion of Latino undergraduates.